According to recent estimates, some 178 million Americans are missing at least one tooth—that’s around three quarters of U.S. adults over age 20. Some teeth are lost due to decay or accidents, while others may have been extracted to resolve dental issues such as crowding in the jaw or impacted wisdom teeth. And some individuals are missing teeth because one or more of their permanent teeth simply didn’t develop—in other words, they are congenitally (“con” – together with; “genitus” – born) missing. Having a missing tooth anywhere can create problems for your oral health. But when the gap is right up front, it’s hard to miss; it causes your smile to look much less appealing. Over time, missing teeth can also lead to bite problems, as well as difficulties with speech, nutrition and self-esteem. The maxillary lateral incisors are a pair of upper teeth located immediately to the left and right of the central incisors (the “two front teeth”). On the other side of them are the pointy canine teeth (also called eyeteeth). Because they are near the front of the mouth, these teeth are quite visible in the smile. They are also the third most likely (after certain molars and premolars) to be congenitally missing. This form of hypodontia (hypo – “below normal”; dont – “teeth”) affects about 2% of the population and usually results from genetic factors. Contemporary dentistry offers a number of effective methods for replacing missing teeth. But when maxillary lateral incisors don’t develop, filling their place in the smile involves some unique challenges. Because they are in a highly noticeable area, aesthetics is a major concern: Not only must the teeth themselves look natural, but the gum line that frames the smile should also be even and healthy in appearance. Having restorative dental procedures done at the optimal time can also present a challenge. Because the problem is often noticed in kids who are still growing, some treatments (such as orthodontics) may need to be started in the teen or pre-teen years; others, such as dental implants, must wait until growth is complete. That’s why a staged treatment plan, involving multiple phases and several dental specialists, is often recommended. To understand what the choices are, and why your dentist may propose a particular plan, let’s take a closer look at what’s involved in treating this condition. 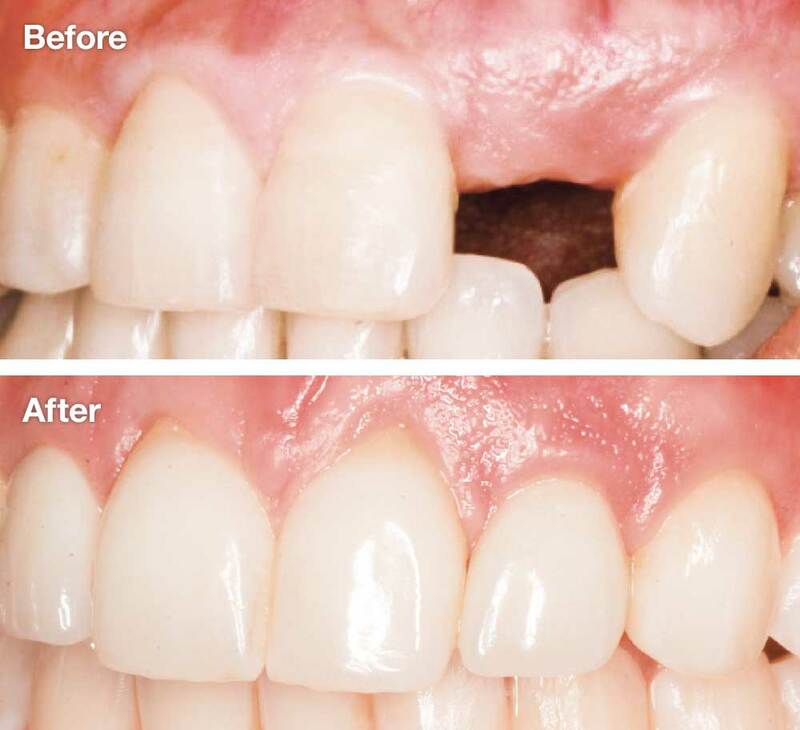 The ideal treatment for congenitally missing maxillary lateral incisors is to replace them in the least invasive way—that is, the method that results in the smallest impact on nearby healthy teeth—while also ensuring that the replacement teeth work well and look good. But because everyone’s mouth is different, the treatment process will be tailored to each individual’s particular needs. In general, however, there are three different approaches to treatment. This smile has missing lateral incisors and many misaligned teeth. However, because the canine teeth are close to the central incisors, they can be moved into a better position with orthodontics. After orthodontic work is complete and canine teeth have been reshaped a bit, the result is a pleasing, natural-looking smile. With canine substitution, orthodontic treatment effectively closes the gap where the lateral incisor didn’t come in. Orthodontic appliances (such as braces) are used to move the canine tooth towards the central incisor, positioning it in the lateral incisor’s space. This approach can often achieve pleasing results with relatively conservative treatment. However, because a canine tooth is larger and pointier than a lateral incisor, it’s often necessary for the tooth to be recontoured or reduced in size; it may also need to receive a crown, veneer, or cosmetic bonding to make it look more natural. Finally, people who show a good deal of gum when they smile may be concerned that their gum line appears uneven around the canine tooth. Correcting this issue may involve gum surgery. Another treatment method is a tooth-supported prosthesis, commonly called a fixed partial denture or dental bridge. It involves attaching replacement teeth to the natural teeth on each side of the gap. Dental bridges are often used to restore missing teeth in other parts of the mouth. In a traditional bridge, one or more crowns must be placed on the adjacent teeth, allowing them to serve as supports or “abutments” for the prosthetic tooth that sits in between them. A conventional bridge requires at least two abutment teeth. Another method, known as the cantilever bridge, requires just one tooth to act as the abutment, and the replacement tooth is supported by it alone. The downside to this treatment is that to serve as an abutment, a tooth must be filed down or “prepared” to receive the crown. Tooth preparation involves removing a significant amount of healthy tooth structure so that the crown can be attached; it is an irreversible procedure and is the least conservative option. Over time, some people may have problems maintaining oral hygiene in this area or may need root canal treatment. However, traditional bridges can reliably support natural-looking replacement teeth for many years. A different method, called a resin-bonded or “Maryland” bridge, doesn’t require any teeth to be capped. Instead, it uses a replacement tooth made with two metal “wings” attached. These wings are bonded directly to the tongue side of the adjacent teeth, so they can’t be seen in the smile. Because little or no preparation of healthy teeth is required, it is the most conservative type of bridge. However, the success rate of this method can range widely. Over time, a relatively large percentage of resin-bonded bridges become detached and must be replaced. There is a high risk of failure depending on the bite relationship. This young man’s left lateral incisor never grew in, causing a very noticeable gap in his smile. When he was old enough, a dental implant was placed in the bone beneath the empty space—along with some laboratory-processed bone-grafting material to provide additional support. After a four-month healing period, he received his final replacement tooth—and a great-looking smile! As in so many other situations, the dental implant has become one of the most popular methods for replacing missing maxillary lateral incisors. The implant itself, which substitutes for the tooth’s root, is a screw-like device made of titanium alloy that is placed directly into the jawbone in a minor surgical procedure. It is attached to a natural-looking dental crown, usually via a connecting piece called an abutment. Only the implant crown is visible in the smile. This system can provide a long-lasting, lifelike replacement tooth that is firmly fixed in the jaw, without needing to compromise the structure of nearby healthy teeth. Studies have shown implants to be the most predictable long-term treatment. Placing implants requires adequate space between the adjacent teeth (both crowns and roots) for the threaded implant base to be inserted into the jaw, and a sufficient amount of good-quality jaw bone for solid anchorage. However, this doesn’t occur naturally in every individual. Orthodontic treatment and in some situations bone grafting can help, but these will likely involve additional procedures and/or other specialists. Also, since dental implants can’t be placed while the mouth and jaw are still growing, this approach may involve waiting until a child reaches the age of 20 (or older) before treatment is complete. What’s the best way to treat congenitally missing maxillary lateral incisors? After a thorough examination, which may include x-rays and/or CT scans of the mouth, your dentist will recommend a treatment plan that is custom-tailored for your individual situation. Many factors have a bearing on this recommendation, including the exact size, shape and spacing of the teeth, the presence or absence of certain types of malocclusion (“mal” – bad; “occlusion” – bite), the stage of growth and development of the face and jaw, and the condition of the jawbone. While it isn’t possible to touch on every consideration that goes into making this decision, we can explore the progress of a hypothetical (but relatively common) situation: Let’s imagine a teenage girl who is missing both of her maxillary lateral incisors. She has some space between her front teeth and her canines (where the missing teeth didn’t come in), but no major malocclusion. In this case, her dentist recommends an implant as the final answer to her missing teeth. But how (and when) does she proceed? Aside from her missing lateral incisors, our hypothetical patient has healthy teeth. So the first step in her treatment will be to determine if there is sufficient space to place dental implants. If not, we will need to open up enough room for the implant-supported replacement teeth. Since some of her teeth have been missing since birth, it’s possible that her front teeth and canine teeth, or their roots, have migrated from their optimal positions. This migration is relatively common, as teeth can be very mobile over time and often drift into nearby gaps. After reviewing diagnostic images (x-rays and/or CT scans), the treatment team will determine how her teeth should be repositioned. In this case, let’s say that her front teeth need to be moved closer together, and her canines moved toward the back of her mouth. Her orthodontist will use standard braces with elastics (rubber bands) to move the teeth into their proper position over a period of months. Like any adolescent getting orthodontic treatment, she will come in to the office periodically for assessment, and to have her appliances adjusted. Following the active phase of treatment with braces or appliances, she will wear a retainer to keep her teeth in the proper positions; she may have a bonded (non-removable) retainer placed behind her front teeth or a removable retainer to maintain the space. But when the orthodontic work is done, instead of having evenly spaced teeth she will be left with a gap that’s just the right size for a replacement tooth…which can’t be placed until she stops growing. What will she do while she’s waiting for her final replacement teeth? The retainer she wears will most likely have a prosthetic tooth molded right into it, so the missing tooth won’t be noticeable. Some retainers are clear plastic trays that fit over the teeth (similar to orthodontic aligners), while others have wires that go over the teeth. Depending on the individual circumstances, a retainer may be worn for months or years. After that, a fixed or removable partial prosthesis may be used to fill in the gap. This may be a Maryland bridge, a removable partial denture, or another device. A retainer helps your teeth stay in their new positions after the active phase of orthodontics is completed. There are many different types of retainers, including clear plastic trays (“Essix”), acrylic with wires (“Hawley”), and bonded retainers. A removable partial denture is an appliance that replaces some missing teeth and is supported by the remaining teeth. There are a few different types, but all can be easily removed from your mouth. A Maryland bridge is a bonded restoration that offers some advantages for young patients. It requires little or no tooth preparation, but can be unpredictable in terms of how long it will last. During this time, her treatment team will closely monitor her growth. X-rays or other diagnostic methods may be used to help determine when her jaw has essentially ceased growing. When we’re confident this has occurred, she can go on to the final stage of treatment. When our patient’s growth is essentially complete, a dental implant can be placed in the jawbone. Implants require sufficient width and depth of surrounding bone to maintain solid anchorage. If orthodontic treatment has gone as planned, she will have enough space for the replacement tooth to fit in; however, having a missing tooth often causes the underlying bone to be deficient in size. If diagnostic images show that not enough good-quality bone is present, bone grafting can be used to build more where it’s needed. Implant placement itself is generally an in-office procedure that requires only local anesthesia. Following placement, a temporary crown may be attached to the implant. The permanent crown follows after a period of healing. It can be expected to look great and function properly for many years to come. Because the incisors are front and center in the smile, aesthetics is a key consideration in this area—and replacing missing teeth here presents a challenge. There is no single “best” answer for replacing missing maxillary lateral incisors; each individual’s situation is different. However, an interdisciplinary team approach may be necessary to ensure that you will receive appropriate treatment at the time it’s needed, and helps you get the best outcome. What do you think is the best tooth replacement solution in my particular situation, and why? Are there any alternatives I should consider? What steps will be involved in my treatment? Altogether, how long do you expect my treatment will take? Can I have a temporary replacement tooth in the meantime? Can it all be done in this office, or will I need to see other dental specialists? What happens if I don’t replace the missing tooth or teeth? by dental health care professionals for the education and well-being of you, the general public. We will provide you with information that is accurate, authoritative, and trustworthy on all aspects of dentistry. Disclaimer - This website does not engage in any medical services nor does it provide medical advice. Dear Doctor, its employees and its Editorial Advisory Board do not endorse any of the procedures or technologies presented on this site. No action should be taken based upon the contents of this website; instead please consult with your dental professional.